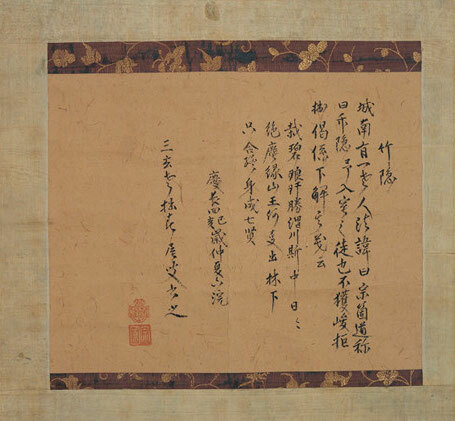 In the 4th year of the Keichō Era (around year 1600) Ueda Sōko’s Zen master Shunoku Sōen composed this irreplaceable calligraphy work to bestow the Buddhist name ‘Chikuin’ 「竹隠」to Sōko, to acknowledge Sōko’s devotion to Zen Buddhism. Revered Priest Shunoku (1529 -1611) was originally from Yamashiro Province. He received the teachings of Shōrei Sōkin and in the 2nd year of the Eiroko Era (1569) Shunoku Sōen became the 111th Head Priest of Daitokuji. Shunoku resided at Daisen-in and Jyukō-in sub-temples in the compound of Daitokuji before founding the sub-temple Sangen-in. Many Tea masters and Daimyō received their Zen training under Shunoku Sōen and he was the officiating priest for the renovation of the Sanmon gate from funds donated by Sen Rikyū. In addition to the ‘Chikuin’ 「竹隠」name given to Ueda Sōko, Shunoku Sōen bestowed Buddhist names to other Tea masters including ‘Kinbo’ 「金甫」to Furuta Oribe and ‘Taiyū’「大有」to Kobori Enshū. Sōko’s signature is in the characters 「宗古」(usually 宗箇). At first glance, this is a very bold message to commit to a scroll. The implication of the characters is ‘Upon mastering oneself through arduous refinement, discipline and cultivating morality, those without such education, taste for the arts and good judgement naturally cease to show at my door’. From this work we get a great sense of Ueda Sōko’s ideal for the person who practices the chanoyu (tea). 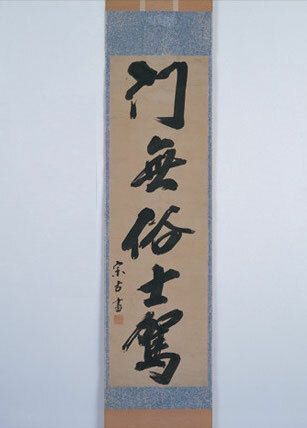 The brushstrokes are enriched with a bold spirit seen in fine works of Zen masters. Ueda Sōko mastered living as a samurai in the turbulent Warring States Period (Sengoku). Throughout his life he pursued quietude for his mind and an unshakable spirit through the practice of Zen. This work emits an aura of one who has transcended worldly desires, and is living an enlightened existence. There are six single-section cut, and three double-section cut bamboo flower vases made by Ueda Sōko that remain in existence. There are no records of Furuta Oribe making bamboo flower vases, however Ueda Sōko certainly devoted time to the art. Sōko’s bamboo flower vases are characterised by strong, almost fierce blade marks cut down the face of the vase in single thrusts. On this flower vase there are additional cuts made to the left and right bottom of the vase. These additions add dynamic energy to the presence of the piece. A kettle with a bold presence, and one owned by Ueda Sōko. The kettle has an unique design, a form that looks more like a Tenmyō kettle (Tochigi Pref. ), though the surface texture and colour are characteristically Ashiya. The irregular position of the vertical surface lines projects rustic beauty. As the bottom of the kettle stops at an odare tier, the whole form of the object on which the kettle is based can’t be known. The vertical lines do, however, continue to the end of the tier, which leads one to see the kettle shape as based on an akoya gourd, perhaps even a samurai helmet. 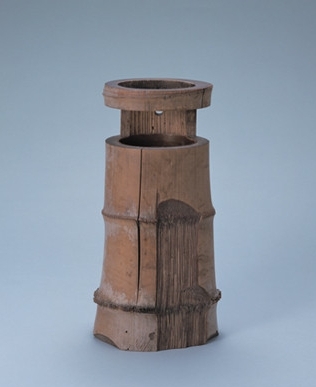 This fresh water container is possibly the result of Oribe’s original design ideas being conveyed from art dealers to potters in the Shinpe-e area. The glaze colour is characteristically Tanba. The glaze of the reverse side wraps around to the front, the bare clay of the front-centre is charred, and the edge of the glaze on the front left and right showing beautiful variations of colour. There are three feet on the bottom of the piece, and the lid is a matching lid (tomobuta). The storage box has ‘received from my lord’ (拝領 hairyō) written on it, making it highly likely this fresh water container was given to Ueda Sōko by Toyotomi Hideyoshi. This is a masterpiece representative of the Momoyama Era. The spectacular tool marks on the powerful body, dynamic wide base, stylised ears, and square mouth are features not seen together on another piece. 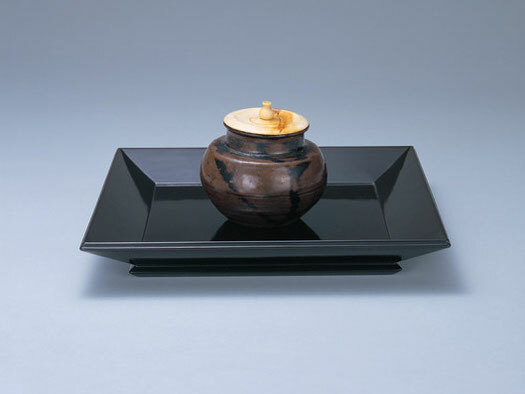 The lid was also made by Ueda Sōko which makes the piece all the more precious. 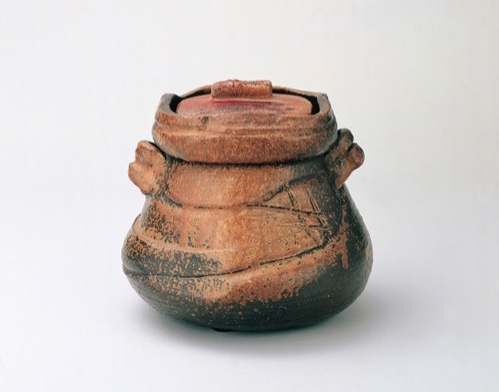 On the box is written ‘Lid by Ueda Sōko, Bizen ware fresh water container’. 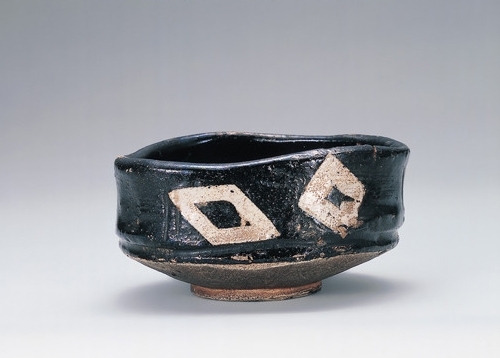 Oribe’s vision had a great impact on Momoyama period pottery. 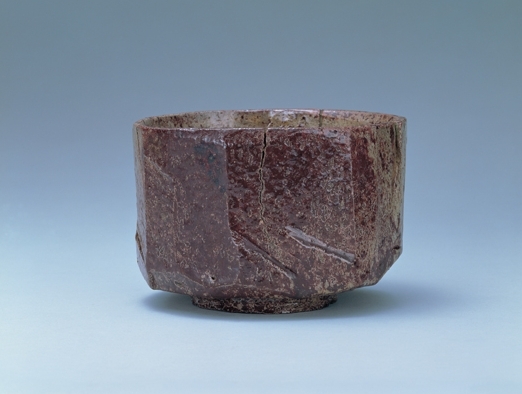 He oversaw the creation of a distinctive style of chawan (tea bowl). The distinctive shape you see in this photo is called ‘kutsugata’ kutsu = shoe, kata = shape. The chawan has the Ueda family crest, kuginuki mon 釘抜紋, on it and it has been a treasured chawan for hundreds of years in the Ueda family. With dynamic tool marks the standout feature, this tea caddy is a classic example of Ueda Sōko’s hand-formed works. This work was fired in the same kiln, made from the same clay, and glazed with the same glaze as the tea bowl ‘Satemo’, Sōko’s most famous work. The kiln was on the grounds of the Kawara estate of the Ueda family in Hiroshima. 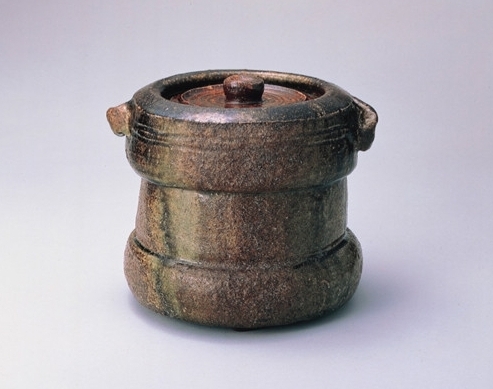 The shape and glaze of the tea caddy are reminiscent of the Rikyu Seto tea caddy that Sōko possessed. The ivory lid has a ‘su-iri’ blemish, and the pouch for the tea caddy is made from a Dutch stripe fabric. The box is made from ‘tagayasan’ Bombay blackwood and has an inlay of flowers and birds. The name ‘Ueda Taikai’ comes from this taikai (‘open sea’) shaped thick tea caddy handed down through the generations of the Ueda family. 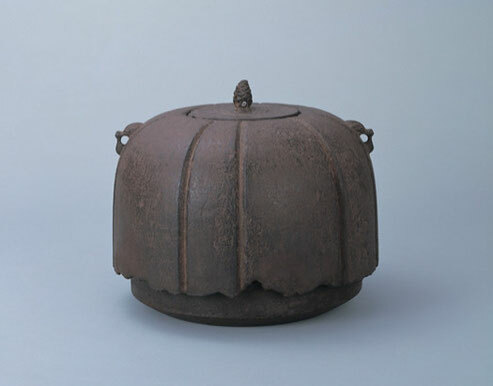 This tea caddy is a classic example of a Chinese taikai. The standout features on this piece are the tall ‘koshiki’ neck, the tall, straight appearance, and the robust lip. The shoulder extends horizontally to a sharp edge. The middle of the torso area is full and projects out to the widest point of the diameter of the caddy. The blackish-brown glaze sits as a beautiful accent over the brown earth base glaze. Two shifuku pouches are paired with the tea caddy: one made from ‘Shikō no nishiki’ Sichuan silver brocade and another from ‘kikkō kaimon ginran’ tortoise shell pattern silver brocade. The large lid is completed with a heishi (sake flask) shaped knob. During the Battle of Kashii in the early stages of the Summer Campaign of the Siege of Osaka, though all other supporting forces had withdrawn, Sōko refused to withdraw his own troops and held ground waiting for the enemy to approach. As he waited, he discovered fine bamboo in a bamboo grove and carved two chashaku with his small sword. The poetic name ‘Teki-gakure’ or ‘In wait for the enemy’ was given to these chashaku that stand as a vestige to Sōko’s composure and unyielding spirit during times of battle. 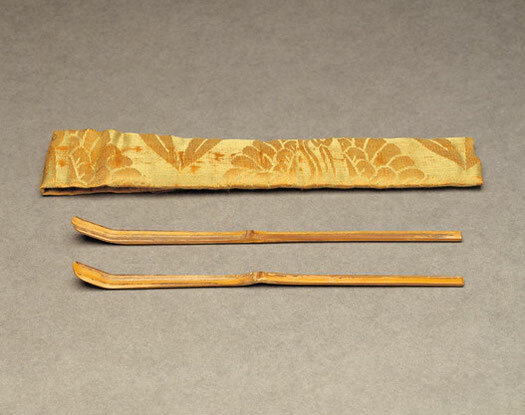 The two tea scoops have different characteristics than those carved by Sōko off the battlefield. These scoops are flat with soft-edged tips, and the tips have been bent in two places. 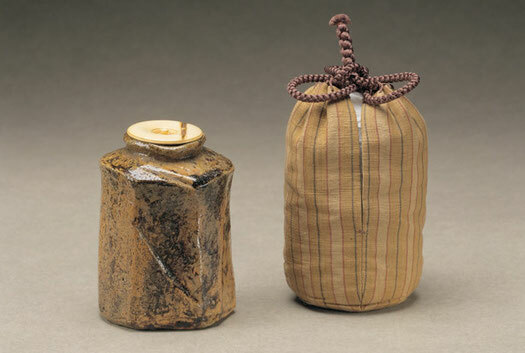 The 12th Grandmaster Ueda Yasuatsu (Jyōō) created the pouch for the tea scoops. The underside of the middle knot is carved away to form a dynamic raised ridge (arigoshi). This feature is seen in both Oribe and Rikyu’s chashaku. The curve in the tip, however is not seen as sharp and with such dynamism in Rikyu’s chashaku as it is in Sōko’s. Sōko’s chashaku are carved thicker than Oribe’s. This chashaku is the most characteristically ‘Sōko’ of all of Sōko’s chashaku. 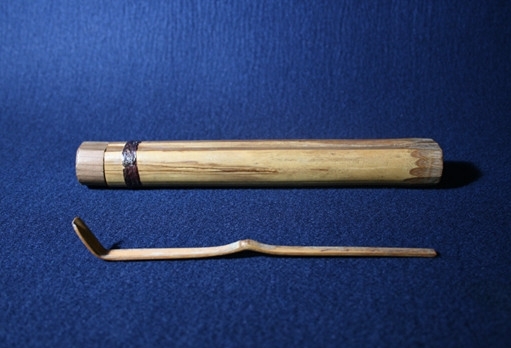 The chashaku is still with its original case.